to be honest, i have no idea what this post will be about. i have a bunch of half-edited catalogues in my drive but i can't decide what to pick from. matcha cake with black sesame buttercream? chai-spiced chocolate chip cookies? 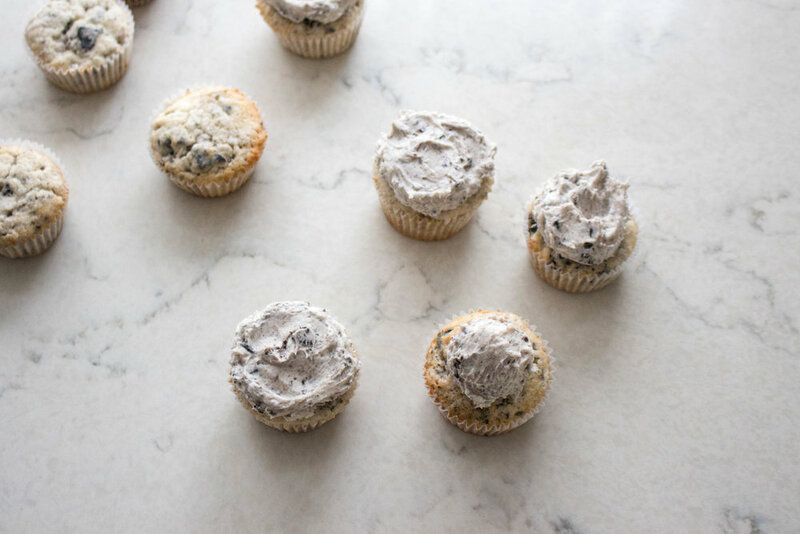 cookies and cream cupcakes? fig and oatmeal dark chocolate bars? currant scones? btw, these are all very real recipes that will one day make their way here. i tell myself each week that i'll edit a little each day so that i'm not rush-editing photos by the time sunday rolls around. alas, i procrastinate, and here we are. sunday morning, halfway through a blog post, with no photos ready. and in reality, this post will probably lag on to monday. i'm kinda pulling a michael scott here ("sometimes i'll start a sentence and I don't even know where it's going. I just hope to find it somewhere along the way"), but with a blog post instead of a sentence. but i realize that this is very real in life in general, where i'm doing things not knowing where they're going, and that's okay. maybe that's better in fact, since i am absolutely foolish. but really- God has sovereign control over everything and knows what is good for me. i think a process of growing up and being in your 20s is learning how to be patient. i read this yesterday in Future Grace, a book i'm currently reading: "the sovereign grace of God to turn the unplanned place and the unplanned pace into the happiest ending imaginable." and so "faith in future grace is faith in grace that is sovereign, and sovereignty that is gracious." and many, many, paragraphs later, i have decided - cookies and cream cupcakes!!!! i made this while i was in between two jobs earlier this year. i had a week off to myself, where i was determined to be okay with doing things on my own. anyways, it was president's day weekend i think - so i hosted some friends over for a "beer, board games, and baked goods" night, and this was the baked good. i also made lasagna for the first time ever - uh those things take a lifetime to make but i finally got to use my lasagna pan! the original recipe for this calls for homemade oreos, but i'm not quite there yet, so the classic store-bought ones had to do. it's a simple white cake batter with oreos mixed in. if you fancy this - try putting a whole oreo at the bottom of the cupcake before filling it with batter!! i've done that before in the past, but forgot to do so this time around. 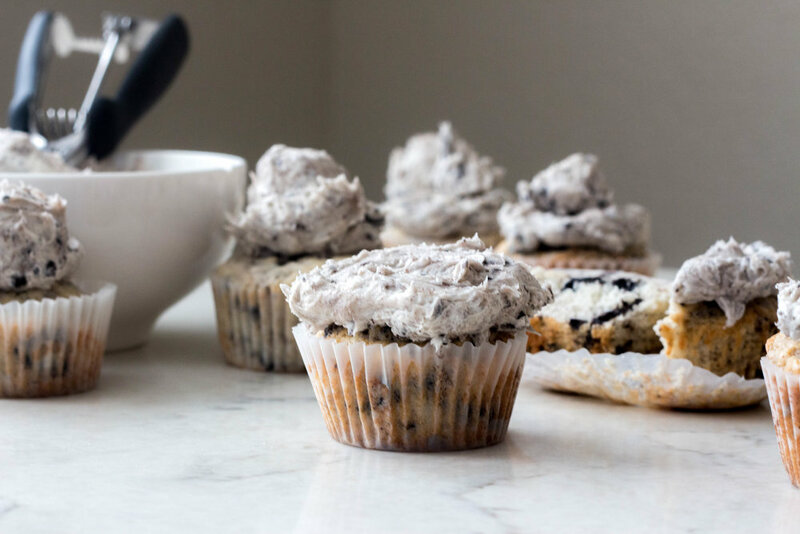 it's a moist cake with oreo bits throughout, and a frosting that resembles just the same but in frosting form. if you crush the oreos into chunkier bits, then that means you'll get more cookie pieces when you bite into soft cake. also, lesson learned that isn't quite a baker's note - if you photograph these things on a marble slab...camouflage alert because they are basically the same color. oops. baker's notes: store-bought oreos are doable, and that's reflected in the recipe below. if you wanna be extra fancy, follow the link below to the original recipe for steps on making your own oreos. a frosting tip i've learned - use a tablespoon-sized cookie scoop, scoop frosting on to the cake, and then using an offset spatula or butter knife, spread it out on the cupcake. voila! fancy frosting tips may not work well since the frosting is chunky. a circle one may do but expect it to ploop with all the air bubbles between the frosting and the cookie. make the cupcakes: preheat the oven to 350 f. line two 12-cup cupcake pans with 14 cupcake liners. space them out between the two pans. in a medium bowl, mix together the flour, cornstarch, salt, and baking powder. in a stand mixer with a paddle attachment (don't use the whisk attachment, as it incorporates too much air), cream together the butter and granulated sugar for 3 to 4 minutes, until light and fluffy. add in the egg whites, one at a time, mixing well and scraping down the bowl after each addition. stir in the oil and vanilla and almond extracts. with the mixer on low speed, add the dry mixture and the milk, in alternating batches. Mix until just combined. fold in the crushed oreos. evenly distribute the batter among the cupcake cups - i like to use a large cookie scoop. bake in preheated oven for about 20 minutes, or until a toothpick inserted in the center comes out clean. cool the cupcakes in the pan for 10 minutes, then remove to a wire rack to cool completely. 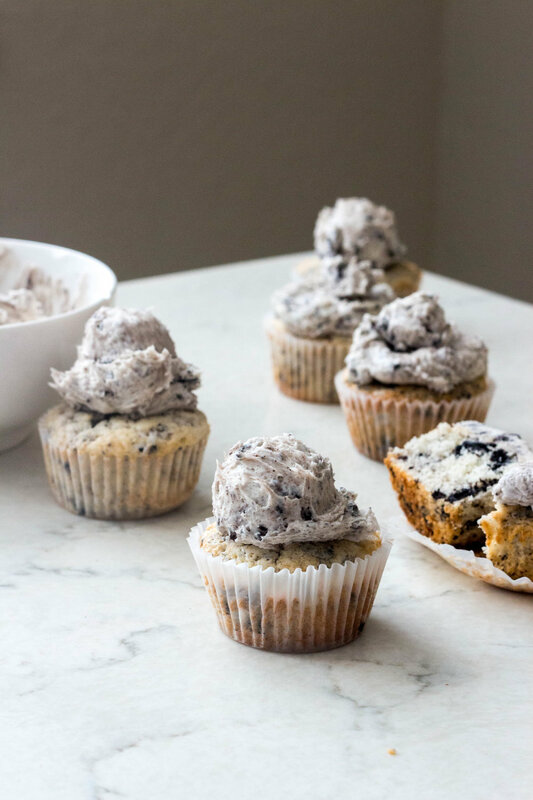 make the frosting: beat all the frosting ingredients together except the oreos until smooth and fluffy. fold in the crushed oreos. assemble the cupcakes: before you start, make sure your cupcakes are completely cool!! scoop the frosting on the tops of the cupcakes, and decorate as you please. i used a tablespoon-sized cookie scoop to dollop on top of the cake. then i used an offset spatula to spread it evenly on top. enjoy!! !